You are here: Home / Style & Lifestyle / A simpler life / A simpler life: How many pairs of jeans do you need? Regardless if you took the reverse packing challenge I wrote about three weeks ago or not, I think most of us could do with a bit of regular wardrobe organizing and decluttering. We live in a time of washing machines, but have more clothes than ever before. In most cases you only wear a few favorites anyway and the rest is just taking up space; making you feel that you have nothing to wear and creating unnecessary stress. A simplified wardrobe actually brings happiness! So where do you start? 1. Does this fit my lifestyle? You might love cocktail dresses and high heels, but how often do you attend parties where you can actually wear this? When we came here, after two and a half years in Dubai, my wardrobe consisted largely of the above items and about 15 sun-tops. I loved those clothes but had to be realistic about the Luxembourg climate and our social life here, so all but two dresses had to go. The clothes you keep should (mostly) fit your every day lifestyle, as it is now. 2. Does this fit me? Oh this is a tricky one! Do you keep clothes that no longer fit you (or never did) in the hope of once again being able to squeeze into them after loosing those extra pounds? Keeping clothes that do not fit is just depressing and if you ever do lose that weight, you might want to reward yourself with some new clothes anyway. So, unless you just had a baby a few months ago, be honest with yourself and make room for clothes that actually fit you, right now. 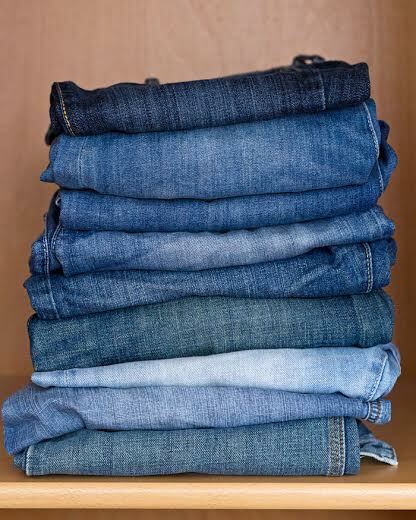 How many pairs of jeans does a person need? And how many t-shirts? There is no right number – you will have to figure out what suits you, but I am pretty sure the number is lower than you think. Challenge yourself by aiming to reduce the number of tops (or bottoms) to half of what you have. Just keep your favorites and pack the rest away. See if you miss the rest in the next months. If not, you should consider donating them to someone who could need them more. 4. Is this my color? We all have colors that suit us. And we all have colors that visually drain us of life and make us look sick and pale. It does not matter if I think red is pretty – if it makes me look awful, I should stay away from it. Find your colors – the ones that bring out the best in you – and only wear those. Sticking to fewer colors makes it easier to combine the items in your wardrobe too, since everything pretty much matches everything else. Picking one or two base colors and one or two more lively, add-on colors, is usually a good rule of thumb. For example my base colors are dark blue, black and grey (so yes that is three, but they all go well together), and my add-on colors are pink and purple. 5. Is this in fashion? I admit I never had any real feelings for or interest in fashion. I mostly wear timeless (boring?) clothes. But, if you do have a good feeling for fashion and want to be trendy – I’d say go for it! However, also know that when the trend is over it is time to move on. Alter if you have a sewing machine, or give to charity if the piece can still be worn. Don’t keep it in the back of your closet hoping for a second chance. Even if trends do come back eventually, they are never the exact same thing the second time around. See also number one – does this fit my life style? So – you have sorted through your wardrobe. Well done! To save you from having to do this work again all to soon, keep these 5 questions in your mind whenever you go shopping. Don’t buy any new clothes that do not pass all the questions. That goes especially for question number three and four. Limit the duplicates and the amount of colors, for an instant simpler life.